The Gut Health Depression Connection | Core Health Free 15 minute consultation! It seems that depression in America is on the rise with no end in sight. In 2017, ten million adults in the United States had some sort of depressive episode. With 15 percent of the American adult population slated to experience depression in their lifetime, it’s time we stop treating symptoms and begin looking at why the symptoms are present to begin with. What is it exactly, that is making our brains behave the way they are? Before we get into the details of the gut health depression connection, let me wow you with a few numbers that just might convince you that widespread depression is not just a coincidence. Statistically, sixteen million Americans have some sort of depressive episode every year. Additionally, three hundred and fifty million people worldwide struggle with depression. Depression is not alone, as approximately forty million Americans experience anxiety. Between the years of 1988-1994 and 2005-2008, anti-depressant use in America increased by four hundred percent, with an estimated one in six Americans taking some kind of psychiatric drug. This in an epidemic that should not be taken lightly. In fact, many children under the age of two are now receiving anti-psychotic and anti-depressant medications. That fact alone is terrifying. Many people today have depression-like symptoms. These symptoms could include malaise, fatigue, flat affect, moodiness, anxiety or even brain fog. A majority of the time, those people walk into their doctor, list their symptoms and are prescribed a “cure-all” medication…an anti-depressant. Most people with these symptoms are desperate for relief, and rightfully so. They end up taking the prescribed medication even though one of the glaring side effects reads “suicidal tendencies”. We could have that debate all day long, but the real question should be WHY does someone have the depression-like symptoms in the first place? Instead of jumping to pharmaceutical ammo, why not take the time to pick through the causes of negative symptoms? There are dozens, if not hundreds of physical, emotional and environmental factors that can contribute to depression like symptoms. What is the patients’ environment? Does he or she hate their job? Is the person getting too little sleep? Is the person extremely sedentary? Are they exercising too much? Are they consuming a diet made up of artificial dyes, colors, and flavors? Do they have the specific nutrients needed to maintain a healthy brain? Or, my favorite since I’ve been in this situation personally, are they taking multiple medications that could potentially be causing the problem? WHY LOOK AT THE GUT? The vast majority, we’re talking seventy to eighty percent, of immune cells are housed in the gut. The immune system is the master control center of inflammation in the body. While acute inflammation can be necessary for healing, chronic inflammation leads to disease. When inflammation is triggered in the gut by a multitude of perpetrators, cytokines are called upon to protect the body. However, these cytokines can damage cells, especially brain cells and neurons, causing an indisputable connection between gut health and depression anxiety. Most of your neurotransmitters are produced in your gut, including up to ninety-five percent of serotonin. Yes, this “happy chemical” is largely dependent upon gut health. Under times of stress or inflammation, the body will use the precursors for serotonin and dopamine (feel-good chemicals), to build less than satisfying chemicals. These cause anxiety, depression, and many other symptoms. This fact alone builds and a sturdy case for the gut health depression link. 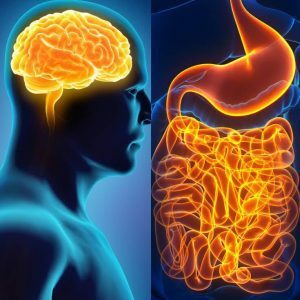 The gut and brain are intimately connected not only via nerve fibers, but through chemical messengers such as cytokines. Those cytokines travel to all parts of the body, from your toes to your (you guessed it) brain! 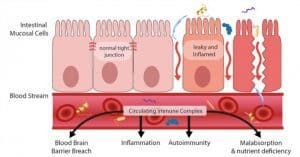 Interestingly, it has been discovered that Multiple Sclerosis (MS) patients show increased permeability of both the blood-brain barrier (BBB) and the intestine. Patients with progressive MS showed increased levels of serum zonulin, while those with relapsing-remitting MS who were in remission showed serum zonulin levels similar to controls. Need more proof that mood disorders can begin in the gut? Studies show that seventy to ninety percent of those diagnosed with IBS also have a psychiatric comorbidity. It’s clear that gut health and mental health are completely intertwined. WOW! Have you ever had “butterflies” in your stomach, or even diarrhea in an extremely stressful situation? This is just one of the examples that show us how the gut and brain are connected. We already know that messages can travel from brain to the gut. 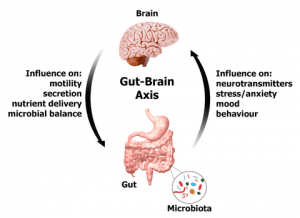 Brand new studies are showing that the large majority of the signals actually travel from the gut to the brain! This implicates that possible neurological disease may start in the gut. In fact, many now believe that Parkinson’s Disease has beginnings in the gut, and works upwards into the brain. We are not what we eat! We are what we eat, digest, absorb, and then assimilate. That’s a lot of steps and a lot of places to breakdown. Many people have inadequate digestive enzymes or stomach acid, leaving them unable to fully breakdown and absorb the food they need to thrive. When humans don’t absorb their food, many critical nutrients are lost, such as vitamin B12, folate, protein needed to rebuild body tissues, magnesium and potassium…just to name a few. Nutrient deficiencies leave gaping holes in the chemical machinery needed to have stable moods, all-day energy, and a balanced immune system. Without a robust immune response and adequate stomach acid, people are predisposed to hidden chronic infections in the gut. These include, but are not limited to, parasites, H pylori, opportunistic and pathogen bacteria, viruses, and worms. Each has the capacity to turn on raging inflammation and rob nutrients from our bodies, all of which are bad for our brains! The foods we eat literally build us up or break us down. Most “foods” today are extremely processed, refined, enriched and the furthest thing from real foods. Eating a highly processed diet full of sugar, grains, and dairy has an enormous effect on mood, cognition, energy, focus, and productivity. Choosing better food options helps in the quest for how to restore healthy gut flora. We are exposed to more toxins today than in any other time in human history. The EPA has allowed over 80,000 chemicals into our environment just since World War Two. The average American puts on 13 personal care products per day, most loaded with a toxic bath of chemicals that can disrupt the gut microflora and create chronic inflammation. Not only that, the majority of our food supply has been tainted with pesticides, herbicides, fungicides, artificial dyes and colors, high fructose corn syrup, and GMO foods. Dr William Osler, the founder of Johns Hopkins Hospital, once said “The person who takes medicine must recover twice, once from the disease, and once from the medicine”. This is very true, as most medications are extremely harmful not only to the liver but to the neurochemical balance in the brain, as well as the gut lining and gut bacteria. Stress has a direct impact on every cell in the body. Rising stress and cortisol levels throw the body into fight-or-flight mode. When in a sympathetic-dominant state, the body is worried about surviving until tomorrow, not about digesting food, controlling inflammation, reproducing. Digestive enzymes decrease, inflammation can rise, and the body becomes catabolic, or in a break-down mode. Talk about two extremes here! The majority of Americans live a largely sedentary lifestyle, complete with beer curls and remote control presses. These people have very poor motility in the gut, as well as an inflamed environment that allows for bad bacterial overgrowth. On the other hand, you have those who exercise too vigorously. Ask a marathon runner or Cross Fit enthusiast if they work out too hard, and the response is always a resounding “NO”. Although movement is good, too much exercise can be a stressor on the body, leading to leaky gut, or intestinal permeability. This leads to immune-related problems, inflammation, and, here it is again, brain symptoms. Have you ever meditated? You don’t have to sit on a rock in the middle of nowhere with your legs crossed to do it. You can meditate for two minutes a day if you would like. Anything that reduces sympathetic dominance will help the body heal, repair, and reduce inflammation. Not only that, meditation such as Transcendental Meditation has been shown to reduce anxiety, depression symptoms, and cortisol in the body. You can find out more on their website. The standard American diet is fraught with processed foods, crazy high calorie snacks, franken-fats, and unbelievable amounts of added sugars. This type of diet wreaks havoc on the connection we see in gut health depression. One way to eat right is to eat real foods. In fact, it is essential to heal gut health depression. Stick with high quality meats from local farmers, ideally grass-fed and pasture raised. Stock up on fresh organic vegetables, a small amount of fruit (mainly from berries), and good fats such as nuts, seeds, ghee, olive oil, avocados, and coconut products. There is also emerging information on the use of probiotics depression treatment, and that includes the symptoms of gut health depression. Find the right exercise for you to help heal symptoms of gut health depression. A key component of exercise is finding something that you can stick to. For example, if you hate running, it’s probably not a good idea to force yourself to run. Weight training can be a great way to balance hormones and reduce cortisol and inflammatory components in the body. Rule of thumb: if you are exhausted after a workout, you’ve probably done too much. GI problems are resolved with a combination of dietary changes, ridding of problematic pathogens, digestive aids, gut repair, and bacterial balance…all aiding in reducing and healing the mental symptoms that come with gut health depression issues. Depression is not simply a mood disorder that keeps to itself up in the brain. Emotional issues and tragic life events are a major contributor to depression, but they are not alone. Before we dispense band-aid drugs like Lexapro and Zoloft, which come with a laundry list of destructive side effects, we need to be looking at diet, lifestyle and emotional factors. When we fix the symptoms from the inside out, we rid the body of the additional damages of unnecessary medications. We fully acknowledge the fact that there is a direct tie between gut inflammation and depression and continue to succeed in our role within functional medicine to eradicate gut health depression.